Reading Notes To Myself is one of those rare experiences that comes only once in a great while. The editor who discovered the book said, "When I first read Prather's manuscript it was late at night and I was tired, but by the time I finished it, I felt rested and alive. Since then I've reread it many times and it says even more to me now." The book serves as a beginning for the reader's exploration of his or her own life and as a treasury of thoughtful and insightful reminders. A friend introduced me to this little gem as a teenager nearly twenty years ago, and I've returned to it often over the years in times of stress. The piercing clarity and brutal honesty of these simple, yet profound, observations slows my racing thoughts and magically puts things into perspective. So find a quiet place, set aside an hour or two, and let Hugh Prather show you how to live in the moment and rid yourself of that insatiable craving for external validation. You won't regret it. I received this book from a friend in 1990. The copyright in the book is 1970, and the cost was a mere $2. I read this book at a time in my life when things were as bad as I thought they could get. I underlined passages, wrote notes on pages, and each time I read it, I feel like I'm getting in touch with myself again. It's an extremely good feeling when you can read your own thoughts and views on the world from someone else.. from someone you don't know. Everyone should read this book, and then pass it on to friends, or children. This book brings clarity to our thoughts, and bridges the gap between the grey world of uncertainty we live in and the black and white world we would want to live in ... or at least some of us. It's nice to stumble across such illuminating guides along this path of life that don't necessarily provide answers, but light the way to an inner discovery, that unto itself, illuminates all answers. I am constantly awed by the immeasurability of his clarity. If you're a searcher, this is a book you'd probably like to read. 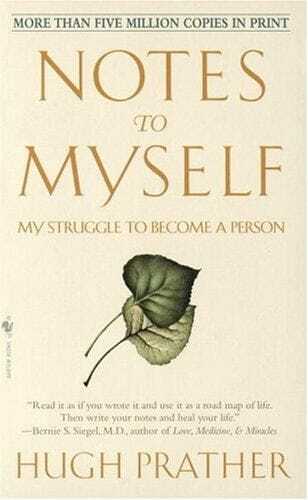 Hugh Prather (January 23, 1938 – November 15, 2010) is an author, minister, and counselor who is most famous for his first book, Notes to Myself, which was first published 1970, sold over 5 million copies and has been translated into 10 languages. Together with his second wife, Gayle Prather, to whom he has been married since 1965, he has authored other books including The Little Book of Letting Go; How to Live in the World and Still Be Happy; I Will Never Leave You: How Couples Can Achieve The Power Of Lasting Love; Spiritual Notes to Myself: Essential Wisdom for the 21st Century; Shining Through: Switch on Your Life and Ground Yourself in Happiness; Spiritual Parenting: A Guide to Understanding and Nurturing the Heart of Your Child; Standing on My Head: Life Lessons in Contradictions; A Book of Games: A Course in Spiritual Play; Love and Courage; Notes to Each Other; A Book for Couples; The Quiet Answer; and There is a Place Where You Are Not Alone. Born in Dallas Texas, Prather earned a bachelor's degree at Southern Methodist University in 1966 after study at Principia College and Columbia University. He studied at the University of Texas at the graduate level without taking a degree. While he could be categorized as a New Age writer, he draws on Christian language and themes and seems comfortable conceiving of God in personal terms. His work underscores the importance of gentleness, forgiveness, and loyalty; declines to endorse dramatic claims about the power of the individual mind to effect unilateral transformations of external material circumstances; and stresses the need for the mind to let go of destructive cognitions in a manner not unlike that encouraged by the cognitive-behavioral therapy of Aaron T. Beck and the rational emotive behavior therapy commended by Albert Ellis.